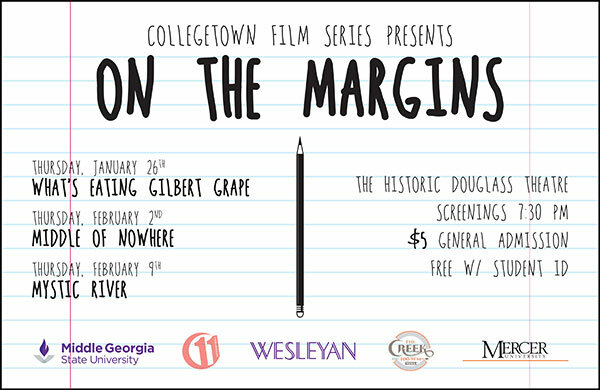 "On the Margins" is the theme of the 2017 College Town Film Series, which kicks off Thursday, Jan. 26, at the Douglass Theater in Macon. A collaboration of Middle Georgia State University, Wesleyan College and Mercer University, the annual College Town Film Series brings students, faculty and the public together to view and discuss educational and entertaining films with a common theme. This year’s film selections, chosen from the theme “On the Margins,” will feature compelling characters and raw stories that exist at the fringes of our social, moral and political imagination. This tale of intimacy and brokenness features young Leo DiCaprio and Johnny Depp and explores the fragile bonds of familial obligation and difference. Ruby, a promising medical student, navigates the turmoil of losing a loved one to incarceration. Directed by Oscar-nominee Ava DuVernay, the film mines the depths of love, loss, intimacy and the emotional terrain of the incarcerated and of those left behind. Clint Eastwood directs a cadre of acting’s finest: Sean Penn, Tim Robbins, Laura Linney and Marcia Gay-Harden in a chilling portrait of life, death, and the legacy of childhood secrets on the mean streets of South Boston. Screenings will be held at the historic Douglass Theater, 355 Martin Luther King Jr. Boulevard in downtown Macon. Students with college ID are admitted free. Admission for college faculty/staff and the general public is $5, which includes a snack pass. Tickets may be purchased at the door on the night of each screening. Free parking is available next to the Douglass at the Mulberry Street parking deck.